For months, the merciless Ironfang Legion has struck out against humanity from its impenetrable, otherworldly Onyx Citadel! But now in possession of a key to this stronghold, the bold adventurers must rally their allies, breach the barrier between worlds, tame an alien wilderness, and finally bring the fight to their hobgoblin conquerors! Can the heroes best the Legion's most devious commanders, including the unparalleled warrior-general Azaersi, or will they fall as readily as their homeland before hobgoblin blades? An ecology of the Vault Keepers and the mythic Vault Builders, who together compose the xiomorn race, by Greg A. Vaughan. "Vault of the Onyx Citadel" is sanctioned for use in Pathfinder Society Organized Play. The rules for running this Adventure Path and Chronicle sheet are available as a free download (2 MB zip/PDF). An amazing conclusion to a great AP! This sixth installment of the 'Ironfang Invasion' wraps up an excellent Adventure Path with a suitably heroic ending. 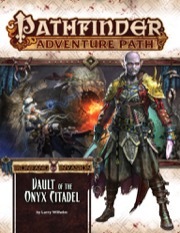 In my previous reviews, I've been able to discuss the narrative arc of the Adventure Path in general terms, without revealing any major spoilers, but those spoilers all lead somewhere in "Vault of the Onyx Citadel," making it exceedingly difficult to discuss the twists and turns in this part of the story. Suffice it to say that players begin this leg of the Adventure Path at 16th level and should be 18th level at its conclusion. Having organized and led a small group of resistance fighters against an invading hobgoblin army, and having learned a great deal about the arcane magics that these enemy forces are using to great tactical effect on the battlefield, the players' previous adventures have earned them seats at a major war council. This opening encounter has a very "Council of Elrond" feel to it and is a fantastic roleplaying opportunity-- literally one of the best pure roleplaying encounters that Paizo has ever written. Many of the allied parties who attend this meeting were likely brought into the alliance as a result of the player characters' actions, giving them credibility and status at a council which is also attended by some of Nirmathas' greatest, most legendary heroes. This is great stuff, truly epic! Anyway, at the council, a dramatic course of action is decided upon, sending the players to a dangerous, hobgoblin-occupied location which will be very familiar to them from previous events-- a location which several of the players likely called 'home' prior to the invasion-- giving this combat-heavy encounter added emotional heft and further intensifying what should already be another powerful roleplaying experience. From there-- and this is where I have to begin obfuscating a bit to avoid major spoilers-- the player characters should be able to appropriate some of the magical power which the invading hobgoblin army been using, allowing them to finally confront the enemy on its own terms. Once all of the dust has settled and the AP plot-line has reached its conclusion, this resolution presents the player characters with a new strange, unknown realm to explore, setting the stage for the next chapter of the players' mighty adventures. 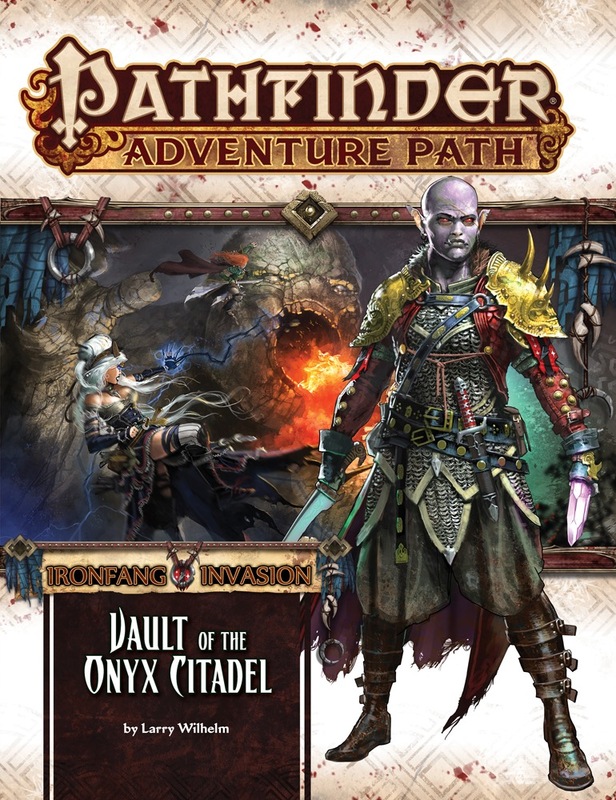 All in all, the "Ironfang Invasion" Adventure Path begins with three top-shelf installments which are literally among the best things that Paizo has produced, which are then followed up by two quite-good chapters, and then the AP strikes gold with this finale. This series stands toe-to-toe with classic Paizo Adventure Paths like Rise of the Runelords or Kingmaker. I highly recommend this AP to anyone looking for a great Pathfinder campaign. Planar travel? Sweet. Always up for some planar travel. Soo... General Azaersi is going to be around CR 21? I am saying that she is going to be around CR 21. No such luck buddy. Apparently she's a swashbuckler of all things. Why on the plane of earth, i ask myself. Didn't the Vault-Builders shape the six chambers of Orv? The showdown taking place in the deep Darklands would be more up my alley. I believe it's revealed in The Emerald Spire. That is correct, though in my opinion what's in Emerald Spire only scratches the surface. Ooh! The Onyx Citadel! I'm looking forward to this! Nice, I might actually have to open that book for the very first time! I wpuld suggest that those interested should also read Planes of Power, as there's information about them in the Plane of Earth section. I hope that the Nirmathas and Molthune armies play at least some role in this. I like the theme and structure of this AP... but I really hate that the climax involves a doomsday weapon. Sounds super cheesy to me. How many other APs' climaxes involved a Doomsday weapon? Not saying that other APs have done it (I only have a few APs in my collection). It's just such a common trope in sci-fi and fantasy literature and movies. I've never been a fan of plots where an entire country or world faces complete annihilation in the climax, whether from a doomsday weapon, a god, or whatever. Just my opinion, didn't intend to put down others who are into that sort of thing... although I guess I could have worded my original post different. So apologies if I did inadvertently offend anyone. The rest of the AP sounds strong enough that I'll probably pick it up, though. I don't really think that that's common of a trope. Well, something really bad happening if the heroes fail is, but that's a given. And plenty of bad stuff is going down in all of the APs if the PCs don't stop it (save for one). Wonder what special stuff Paizo has planned? None in the AP line (according to James Jacobs). Awesome! We finally get to see Azaersi! So any subscribers have there copies of this yet? I have mine. I don't usually jump into the AP questions, but I'll answer if there's anything specific you're looking for. What celebrity would you say the Vault Builders resemble most. If Azaersi managed The Spice Girls, which one would be the first to die. Which Michael Bolton song would you play for the final battle. All I've read so far is her wite-up in teh Appendix, but she's presented there as being ruthless, keenly tactical, and trusting the arcane magic of her adviser. Any chance we can get a little Bestiary love Skeld? Thank you both Zaister and Skeld! Can you give more info on the Vault Giant, Onyx Scourge, and Zarxorin? Any major things in the continuing the campaign section? Question for subscribers: what role does Molthune play in this volume and in the "continuing the campaign" section? Can you tell us what is the level cap of the adventure?